Just between the Festival Halls and the Pferdeschwemme, you will find a tunnel connecting the Altstadt town centre with the city districts of Riedenburg, Maxglan and Leopoldskron. This tunnel is called Neutor or Siegmundstor and was built between 1764 and 1767. Initially, Prince Archbishop Siegmund Schrattenbach planned to cut a path through the Mönchsberg Mountain to achieve this connection. He abandoned this plan in 1759 and instead of the section, he ordered the engineer Elias von Geyer to built a tunnel. The Hagenauer brothers were responsible for the decorations of it. The Siegmundstor tunnel is 135 metres long and oriented in a gentle angle to allow water to run out and light to penetrate deeper into the mountain. 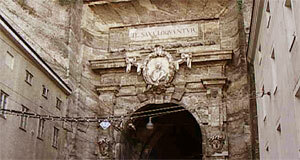 The entrance on the old town side bears an emblem with a portrait of Prince Archbishop Schrattenbach. Above this emblem, a Latin inscription says: "Te saxa loquuntur", meaning "The stones are talking of you" in honour of the Prince Archbishop. The other side of the tunnel is decorated by a display of St. Sigismund in antique armour. It is crested with war trophies and the coat of arms of Prince Archbishop Siegmund Schrattenbach. All in all anything but humble references. The sides of the tunnel are decorated by obelisks. Initially, the tunnel was called "Neutor" and the square by the Pferdeschwemme Siegmundsplatz Square. Later, the square was re-named "Herbert-von-Karajan Square" in honour of the long-serving creative director of the Salzburg Festival. The Siegmund-reference was moved to the tunnel, however, most locals from Salzburg still refer to the Siegmundstor as the "Neutor".